Anne Vercelli is a tiny-but-mighty dynamo and if you are ever graced to meet her, you will fall in love with her. I did when I first met her while she was working her weekend (!!) job, as hostess for the fantastic Costeaux Bakery in Healdsburg. She’s humble, petite, and generous in every way. Truly hospitable and very charming. 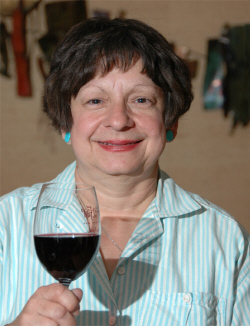 She is involved to her elbows in teaching classes at Santa Rosa Junior College, organizing The San Francisco Chronicle Wine Competition, participating in judging wine competitions, supervising, promoting and the West Coast Representative for the Atlantic Seaboard Wine Association, and engaged in everything involving wine and cuisine pairing. She is the proud daughter of Joseph Vercelli, who was one of the “Old Timers”, the originators, innovators and pioneers of today’s wine industry in Sonoma Wine Country. She carries on his legacy with aplomb, endless energy, infectious joy and love for life. She agreed to be interviewed and I went in really knowing nothing about her. I just knew she taught and was involved in the San Francisco Chronicle Wine Competition. Well, she is a force and absolutely an inspiration. My husband and I were blown away with her knowledge, intelligence, expertise and warmth and amazing culinary skill. Thank you Anne!. Anne received her B.A. in Food and Nutrition from California State University, Sacramento in 1977.